We all know that each individual’s customer journey: that path from awareness to purchase, is unique, and social media can definitely have an impact on that journey. And understanding multi-touch marketing and the role that different social media channels play is key for marketers. For some products, those with a simple value proposition—say, beer, for example—that journey can be a quick one. Well, for me at least. See a social media post from of my friends about beer. Get immediately thirsty. See beer in store. Put beer in cart. Done. But when your product has more nuance to it, or involves a unique value, or, perhaps, is a huge investment like an Apple Watch, there may need to be many more marketing touchpoints to consider before your customer decides to buy. Let’s take the Apple Watch—although sales have been great, with Apple selling more watches in their first quarter of availability than it did iPads or iPhones, I would bet that most of the general population needs a bit more time to understand the product and its value before they drop the cash for such a radical new product. Does it live up to its hype? Is the first generation product high quality? Who exactly are the people who are buying this latest gadget? What the heck is an Apple Watch going to do for me? And really, do I even need one if I already have a smartphone or a FitBit? Boom. Enter the many marketing touchpoints that a brand has to be ready to capitalize on. Multi-touch marketing is exactly what it sounds like it is. A new way for marketers to “think” about their customer’s buying journey. The days of focusing on a buyer’s last touchpoint—a landing page, or a webinar—and believing that touchpoint alone was the Golden Egg of conversion are over. Today, knowing how all the touches fit together are what’s important for marketers. Multi-touch marketing is a blog post for another day—a marketer using multi-touch attribution data puts a “value” on certain steps of the buying cycle, using data gleaned from analytics, CRM software, and customer service teams, and it can get complicated—but I mention it because for many consumers out there, being as digitally savvy and perpetually digitally connected as they are, social media is one of THE most important touchpoints on their purchasing journey. 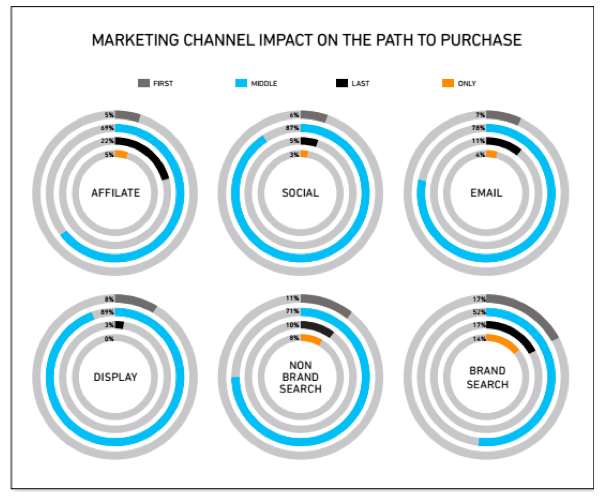 Convertro is one platform helping marketers do a deep dive into multi-touch attribution marketing, and they recently released some interesting research that digs into multi-touch attribution in order to analyze social media exposures and better understand how, exactly, social media influences sales conversions. First: The beginning of the customer journey. This is the awareness stage. This is where the power of search plays a big role (both brand-specific search and non-branded, but product-specific search as well), as it has a big impact on overall brand awareness. This is also where your display advertising plays a big role, whether it’s TV, out of home, print, or perhaps even direct mail. These are all marketing touchpoints that are a part of the first stage of the customer journey. Middle: The middle of the customer journey doesn’t get the most attention because it’s hard to decipher how it relates to purchase, but that doesn’t make it any less essential. As you can see from the below, so many things impact the middle part of the customer journey. This includes your affiliate marketing, social media, email marketing, advertising, and search. Notice the large role that social media plays in that middle part of the journey—that’s the discovery phase, where potential buyers are gathering information, asking questions, touching base with peers—all those things that social media is extremely helpful for. Last: The end of the customer journey often gets the credit for the sale. Again, we see affiliate marketing playing a role at this late stage of the journey, as well as the impact that search plays in every part of the customer journey, and we also see that email continues to play a large role. This is also where your email nurturing campaigns pay off, as it’s often that nurturing that leads to the sale. Note that in this last part of the journey that social media doesn’t play such a big role, which isn’t really surprising. Only: We also need to recognize the important marketing touchpoint that drives a sale without any other effort. Impulse purchases often fit into this category. But more importantly, this is where the power of search is so evident. People go to search engines to find what they need, they find it, they buy it. One touchpoint. Email plays a small role in the no-touchpoint game – think how many times you’ve gotten an email and clicked through and made a purchase. I did that just yesterday, on a first email I received from a retailer who happened to feature something I liked. One touchpoint purchase. Done. Social can also be a no touchpoint category. Think about the times you might’ve seen a paid ad on Facebook and clicked through and bought something. That’s a one touchpoint, social media-driven, customer journey. How Does Social Impact the Customer Journey? 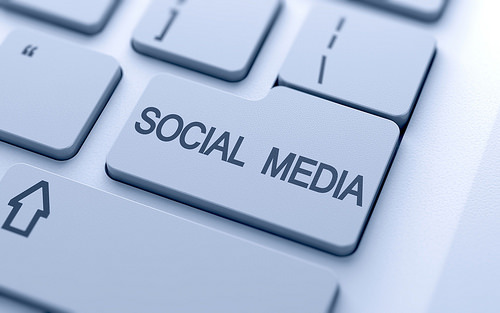 So, how does social media impact the customer journey? I think you can see some of the ways social has an impact described above. As we can see, it’s not unusual that social media falls into that middle segment on the customer path, where it can impact customer awareness. This happens to me all of the time, and I’ll bet it does you, too. I may have heard of a new product, haven’t had the chance (or inclination) to search for it, but then I start seeing it mentioned more and more within my social networks, by people I trust, before I know it I’m on a path to purchase. Or, I flat out ask my friends if they’ve heard of, used, or had experience with a company or product, and I get lots of valuable feedback and ultimately drives my path to purchase. Of course, as with most things in life, the question of the overall impact of social media on the customer journey doesn’t have just one simple answer. Not all social platforms are created equal, and different channels fall in different places in the funnel. For example, YouTube and Facebook are stronger when it comes to the beginning and the end of the funnel, that is, in the introduction of new products, and then the services and conversions. This only makes sense. You might be attracted to a YouTube video or a Facebook post (or video) and become aware of and/or see how you might use a product. You might also use these channels, especially YouTube, near the end of your journey and/or after the purchase, as you look for how to demos and feedback about the product from trusted peers. Google+, Pinterest, LinkedIn, even Tumblr and Twitter, are all much more firmly entrenched in that middle-funnel position. 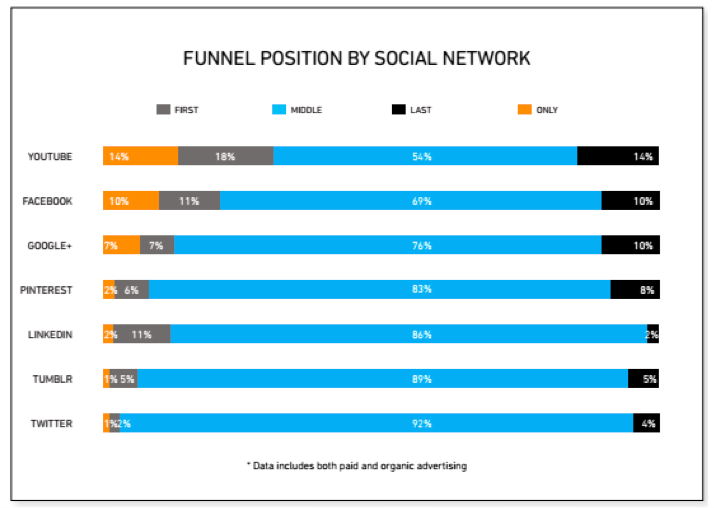 Note how strong YouTube and Facebook are in the “only” position in the funnel. Rich media (especially video) and/or paid Facebook and YouTube marketing campaigns work. Make sure you’ve got that factored into your marketing strategies and your budget for 2016. Especially if you’re in the B2B space. Paid social outperforms organic. Period. Don’t expect to use social media and reap measurable results if you don’t allocate a budget for it. If you’re using social for organic impressions only, you can certainly build awareness and influence, to a degree. But if you want to start moving customers through the funnel toward a sale, you will need to spend. As the folks at Convertro put it, “…while organic social advertising is usually a middle touch point that marketers can leverage to keep the consumers engaged and accelerate conversion, paid social advertising definitely works for new customer acquisition tactics, appearing many times as FIRST or ONLY touch points.” And the impact is substantial; in this customer analysis, social spend increased conversions by 25 percent over organic social. Of course, paid social isn’t one-size-fits-all. There is no easy, go-to formula for social advertising success. You have to start by having a keen understanding of your audience. You need to know their demographics, know what behaviors indicate where they are on the buyer journey, and you have to know your products. Translating all of this knowledge into effective paid social advertising is often as much an art as it is a science, but that’s the beauty of testing. Most of the social advertising platforms offer robust tools for customer segmentation, smart targeting, and endless opportunities for testing the effectiveness of your messaging, your copy, and your art. That’s one of the benefits of paid social versus other types of paid advertising. Once you’ve paid for a magazine ad or a TV spot, there’s not generally an option to modify a campaign midstream if its not hitting its target. Social advertising, however, is agile. You can launch, test, tweak, and continue fine-tuning until you get the results you seek. Understanding the customer journey is key to a successful marketing campaign. You need to know how your customers move through your funnel, and it’s also essential that you carefully consider where different social platforms and messaging fit into that journey. Social media can be highly effective at moving your audience forward with a sale, especially if you take a strategic approach to paid social, but remember, never put all your eggs in one basket. As for multi-touch attribution marketing? Watch this space, I’ll write about it soon. What are your thoughts? Are you already immersed in multi-touch marketing? Have you found completely different results when it comes to social touchpoints in your buyers’ journeys? Or, do you agree with the results from Convertro? I would love to hear about your experiences. This post was originally seen on The Marketing Scope blog.